Your vehicle is equipped with a front passenger occupant classification system. This system detects the conditions of the front passenger seat and activates or deactivates the devices for front passenger. *1:The system judges a person of adult size as an adult. When a smaller adult sits in the front passenger seat, the system may not recognize him/her as an adult depending on his/her physique and posture. *4:For some children, child in seat, child in booster seat or child in convertible seat, the system may not recognize him/her as a child. Factors which may affect this can be the physique or posture. Observe the following precautions regarding the front passenger occupant classification system. Failure to do so may cause death or serious injury. 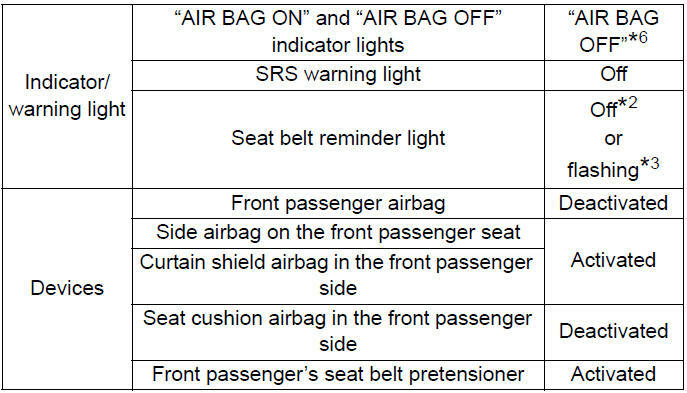 ●Make sure the “AIR BAG OFF” indicator light is not illuminated when using the seat belt extender for the front passenger seat. 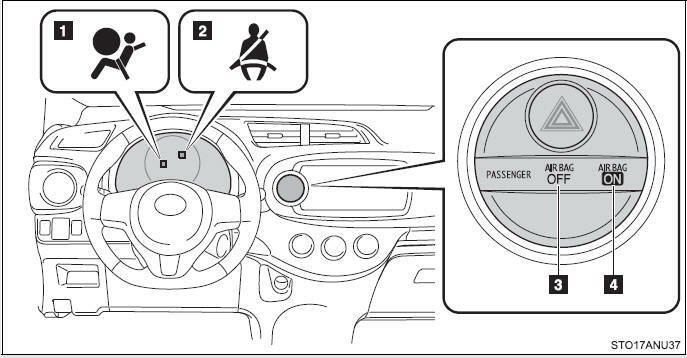 If the “AIR BAG OFF” indicator light is illuminated, disconnect the extender tongue from the seat belt buckle, and reconnect the seat belt. Reconnect the seat belt extender after making sure the “AIR BAG ON” indicator light is illuminated. 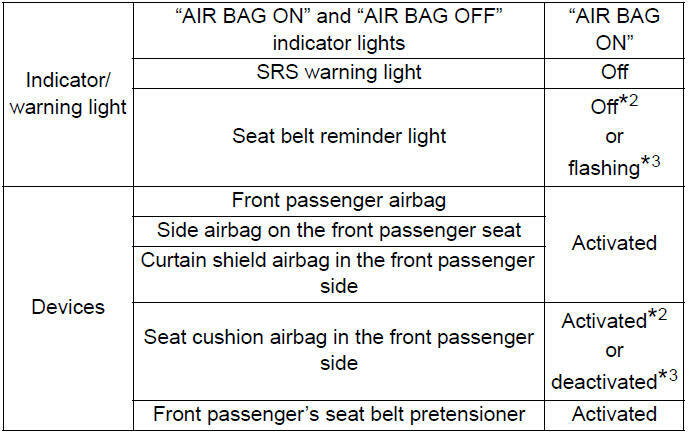 If you use the seat belt extender while the “AIR BAG OFF” indicator light is illuminated, the SRS airbags for the passenger may not activate correctly, which could cause death or serious injury in the event of collision. ●Do not apply a heavy load to the front passenger seat or equipment (e.g. seatback pocket). ●Do not recline the front passenger seatback so far that it touches a rear seat. 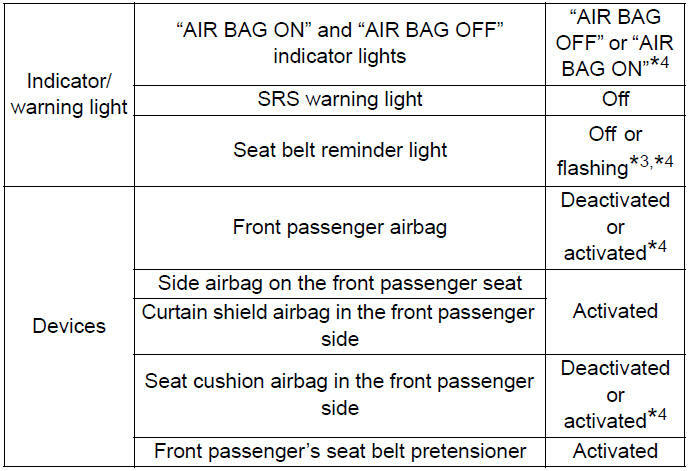 This may cause the “AIR BAG OFF” indicator light to be illuminated, which indicates that the passenger’s airbags will not deploy in the event of a severe accident. If the seatback touches the rear seat, return the seatback to a position where it does not touch the rear seat. Keep the front passenger seatback as upright as possible when the vehicle is moving. Reclining the seatback excessively may lessen the effectiveness of the seat belt system.